This year for the Sci Fi Experience, I’m off on The Great Khan Adventure, tracing the story of Khan Noonien Singh through books and movies. So far I’ve watched some of Star Trek: The Original Series, and read the first book and the second book in Greg Cox’s Khan trilogy. 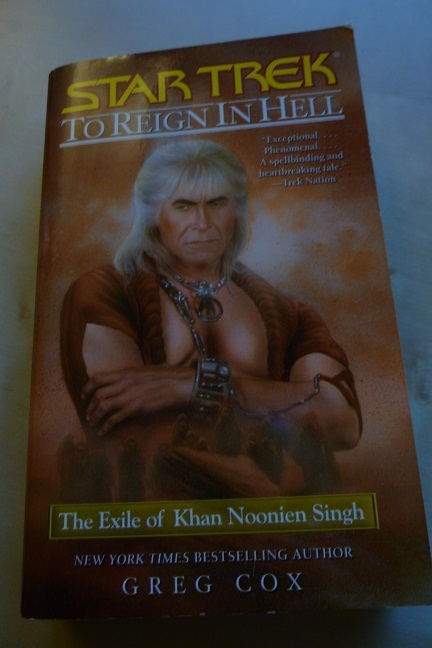 The final book jumps ahead from the 1990s and the Eugenics Wars, past “Space Seed” to Khan’s time on Ceti Alpha V: To Reign in Hell: The Exile of Khan Noonien Singh. We watch Khan and his crew’s transport down to the planet, the colony’s hopeful beginnings…and then the increasing struggle to survive after Ceti Alpha VI explodes, and the ecosystem on Ceti Alpha V collapses. The story is told from the alternating points of view of Khan and Marla McGivers, the Starfleet officer who fell in love with Khan and chose exile with him. As I hoped, we get more depth into Marla and see her emerge as far stronger than she did on the TV episode. She faces down Khan’s hostile crew, stands up to Khan himself, and perseveres through very trying circumstances. In part this is possible because Cox also softens Khan, particularly towards Marla. I think I know now why Khan’s brutality in “Space Seed” surprised me—I had read To Reign in Hell more recently than I’d seen the TV show. Cox takes Khan on a journey from a well-intentioned, if fierce, leader to a madman obsessed with revenge; it’s a compelling journey, except that I think it downplays how violent and ruthless he was to begin with. This book is effective as a chapter in a larger story, filling in the gap between the TV show and the movie. Taken in isolation it’s an odd beast, because we spend it exiled with the villain. I found myself missing Seven and Roberta, mostly for the role they fill as opposing forces to Khan. Khan and Marla have their virtues and their flaws, but they never really feel like they become heroes of the story—they’re the villain and the woman who fell in love with him. That complicates the emotional pulls of the story, and isn’t resolved by a very brief frame story with Kirk, Spock and McCoy. I also think Cox exploded Ceti Alpha VI too soon. I enjoyed watching the hopeful days of the colony; once disaster strikes, it becomes a hopeless slog for Khan and the reader both, especially when we know how this turns out…and it isn’t good. Despite some reservations, the book does fill in a significant chapter in Khan’s story. It provides a lot of insight into Khan’s character, and expands Marla into a compelling character in her own right. There’s also quite a bit of action, and of course all those little touches Cox is so good at of tying everything together. When you watch Wrath of Khan, check the special features. I swear I’ve seen an interview with Cox about this series before, and it might very well have been a feature on the movie. Might be worth checking out if it’s on there. Interesting. I hadn’t realized there was a story that filled in the gap in the Khan arc. But then, much as I love Star Trek, I haven’t read many of the novels — though a few of them are among my favorite SF books and never mind their ST affiliation. Diane Duane’s first two Rihannsu novels were amazing, and I’m pretty fond of The Wounded Sky as well.